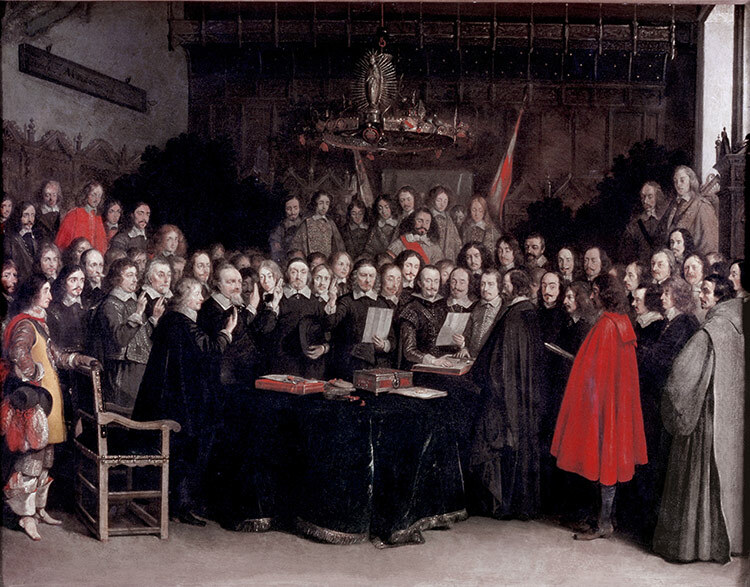 The Peace of Westphalia, which brought the brutalities of the Thirty Years’ War to an end in 1648, still looms large as a major turning point in the history of both international law and international politics. Indeed, few historical events can match the prevalence of the Westphalian myth, which holds that the Peace marked the emergence of the sovereign state and the modern international system as we know it. The source of this enduring myth can be traced to an influential article by Leo Gross, described by one critic as ‘the Homer of the Westphalia myth’, which was published in the American Journal of International Law in 1948. Writing on the tercentenary of the Peace, soon after the founding of the United Nations, the Austrian-born legal scholar described 1648 as ‘the majestic portal which leads from the old into the new world’ and ‘the starting point for the development of international law’. This is still the dominant image of Westphalia: a major turning point between the medieval and the modern, the birth certificate of the international legal order. Political and legal theorists generally adopt wholesale the views promoted by Gross, while historians have done little to dispel this myth. Even today, when scholars regularly invoke the need for a ‘post-Westphalian’ order, or wonder what lies ‘beyond Westphalia’, they implicitly take Westphalian sovereignty as their natural starting point. It is rare to ask ‘why Westphalia?’, though it is a far more useful query if we aim to broaden the scope of the history of international law and politics. For when we consider the content and context of the treaties of Westphalia, it is clear that they did not radically alter the nature of sovereignty, nor did the Peace invent a new international system. The idea that Westphalia paved the way for an international system of sovereign states relies on the argument that the treaties dismantled the twin supreme authorities of the Catholic Church and the Holy Roman Empire. Yet there was nothing particularly new or groundbreaking in the treaties that caused this: Protestantism had been recognised by the Empire as early as 1532 in the Treaty of Nuremberg. Though the Catholic Church’s political authority was certainly declining throughout the early modern period, there is nothing to suggest that Westphalia provided the ultimate turning point. Similarly, the idea that the Holy Roman Empire was replaced by a network of independent states after 1648 is exaggerated. The Peace of Westphalia officially gave imperial princely states the power to sign treaties, but this had already been widely practised for at least a half century before. Brandenburg, for example, had independently formed an alliance with the Netherlands in 1605. The German states still thought of themselves as a single body after the Peace: the Emperor was recognised as their overlord and representatives were still sent to the Imperial Diet, which retained control over legislation, warfare and taxation. Overlapping sovereignties were as much a fact of life and a source of conflict after 1648 as they had been before. So why does Westphalia still figure so prominently in the history of international law and politics? One answer is perhaps the ahistorical nature of those two disciplines. Westphalia is detached from its context and assigned great importance because it suits the narrative of existing international law and international relations as Whiggish, evolutionary processes. So 1648 marks the first stepping stone on a path that leaps neatly from there to 1815, 1919, 1945 to the present day. By cutting out events before this date and painting Westphalia as the birthplace of the sovereign states system, the historiography of international law and politics is narrowed to make the formation of the existing settlement seem inevitable. Any alternatives outside the realm of sovereign states are discounted. The results of this narrowing are clear. It is as difficult for us to properly envision the Holy Roman Empire, with its confused sovereignties and stubborn refusal to act like a conventional ‘state’, as it is for many international relations scholars to account for the increasing influence of non-state actors in contemporary politics. The challenge, then, is not to imagine a ‘post-Westphalian’ world order, but instead to apply a historical, non-Westphalian perspective to our study of international law and politics in the past, the present and the future. Cormac Shine is a Scholar in History and Political Science at Trinity College Dublin and a member of the Graduate Institute of International and Development Studies, Geneva. 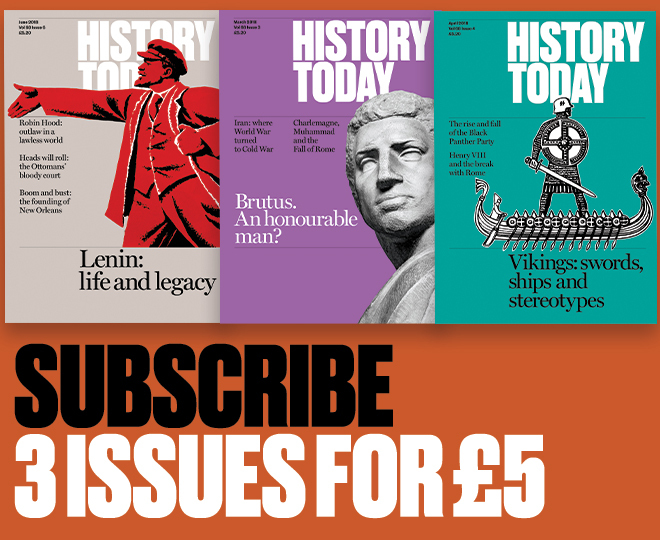 Who Won the Thirty Years War?